The hotel room was super clean and stocked with all the supplies you could possibly need. The bed was very comfortable. Would definitely stay here again ! Everything: the staff were incredibly helpful, the location was great, the facilities were fantastic, including dry and wet sauna, and washing machine and dryer. Fantastic. Really nice modern place to stay with friendly and professional staff. The room was delightful, its automated welcome was fun, and it felt utterly luxurious to have a full kitchen and... *drool* laundry machines! My god, all hotels should have this. The bath tub was also great. The room was very comfortable - loved the amenities and the breakfast, bike access was a great perk as well. Very well thought out hotel and I liked that it sort of integrated the community. Great location and a very nice room to retreat to after a long day. Perfect hotel and location. Amazing modern rooms and bath. Wonderful staff and breakfast. Overall -- a joy to be there. Thank you Boxotel!!! 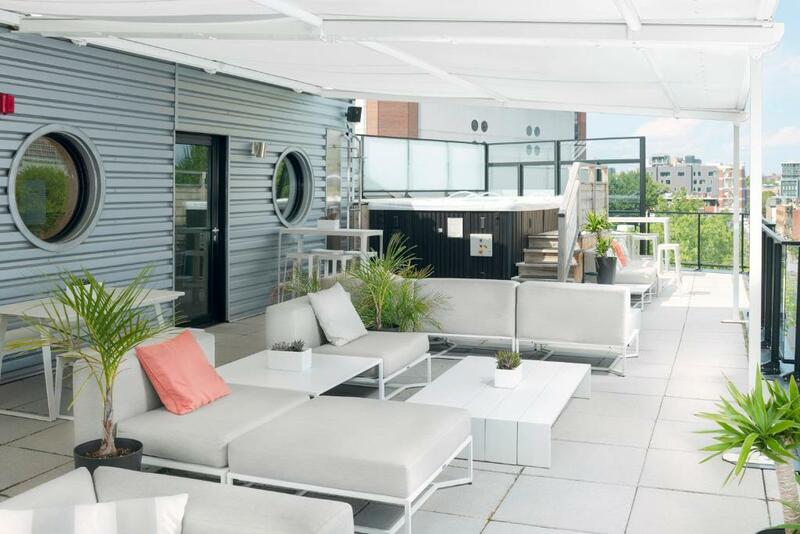 Boxotel is a fine little boutique hotel. Seems to be only a couple of years old. Clean as can be. High quality rooms contain full kitchen and good washer/dryer, plus excellent washroom. Room had at least a 9 foot ceiling. Breakfast was served by their own Nomad cafe and was healthy and tasty. The rooftop terrace is great - take up a glass of wine or cocktail and chill, or jump in the hot tub, or simply take a coffee and read a book. There are lots of good restaurants not too far away (e.g., Restaurant Grenadine next door and Au Petit Extra). Lock in a great price for Boxotel - rated 9.4 by recent guests. Just 550 yards from the Place-des-Arts, the eco-friendly Boxotel provides modern, open-concept studios and lofts in the heart of Montreal's Quartier des Spectacles. A spa is located on the rooftop of the hotel where you will also find the terrace and mini-gym. Each guest unit has many automated functions, including lights, curtains and temperature controls. All have a fully equipped kitchen, flat-screen TV and washer and dryer. Frosted glass windows separate the bathroom from the rest of the apartment. Café Nomade is conveniently located on the ground floor. It offers light and healthy fare as well as delicious coffees and alcoholic beverages. 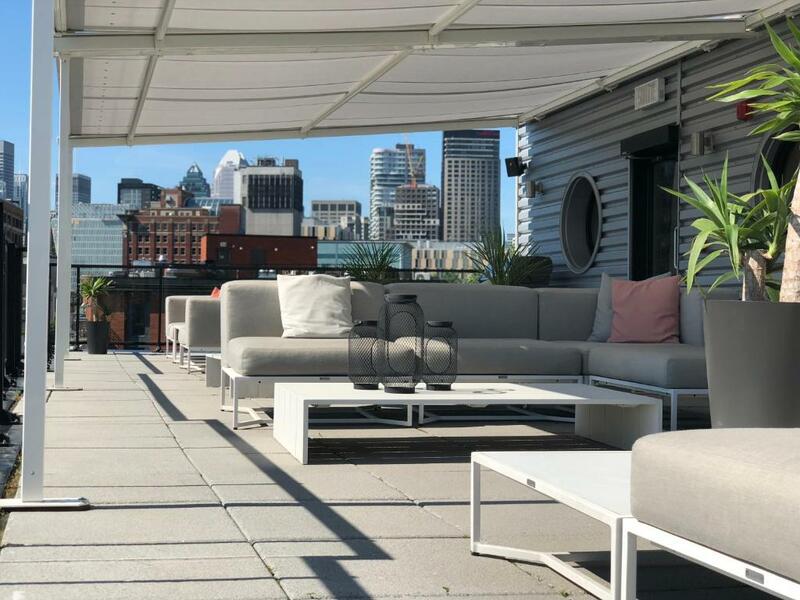 Boxotel is 4 minutes' walk from the Saint-Laurent metro station. Bustling rue Sainte-Catherine, home to many shops and restaurants, is only 500 yards away. Boxotel has been welcoming Booking.com guests since 8 Dec 2016. When would you like to stay at Boxotel? This studio has a balcony, a fully equipped kitchen and a washer and dryer. This studio has a fully equipped kitchen and a washer and dryer. Called the "Grand Studio Queen", this studio has a balcony, a fully equipped kitchen and a washer and dryer. It is also wheelchair accessible. Called the "Grand Studio King", this studio has a balcony, a fully equipped kitchen and a washer and dryer. Called the "Loft King", this unit has a fully equipped kitchen and a washer and dryer. It also contains one sofa bed. 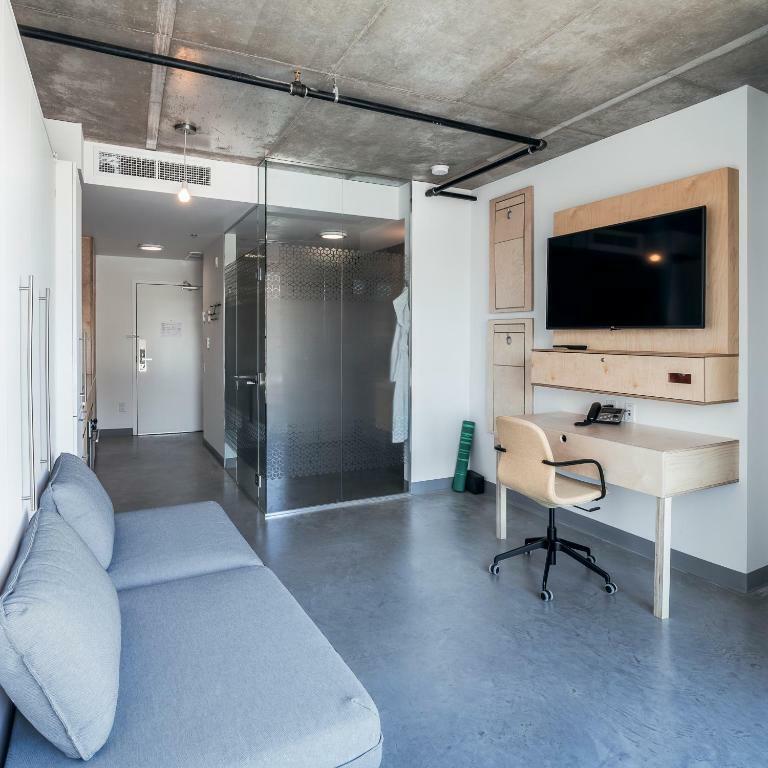 Called the "Loft King Luxe", this unit has a balcony, a bathtub, a fully equipped kitchen and a washer and dryer. It also contains a sofa bed. Called the "Grand Loft King Luxe", this unit has a bathtub, a fully equipped kitchen and a washer and dryer. It also contains one sofa bed. This two-storey suite has a private furnished terrace with a barbecue. The suite contains a fully equipped kitchen with dining area and a washer and dryer. 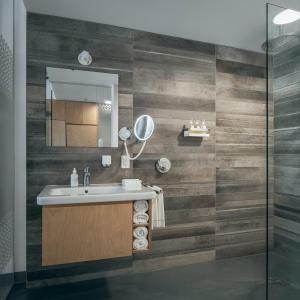 The bathroom features a double shower and separate bathtub. 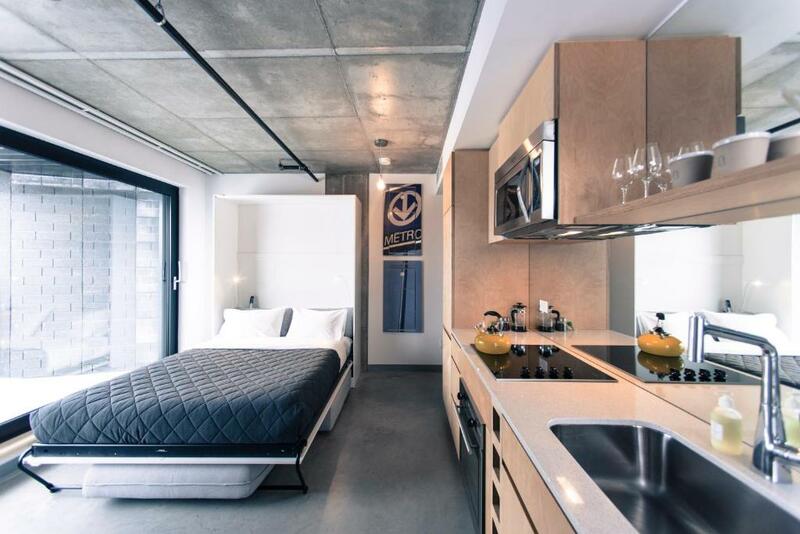 Boxotel is a boutique eco-friendly hotel in Montreal’s Quartier des spectacles. Modular, simple and efficient, Boxotel’s apartments answer to a clientele in transit wishing to settle in and nest. All rooms have complete kitchen, washing machine, dryer and bathroom. Adding to the experience the automation of many functions like lights and room temperature, makes a unique stay with total comfort. Boxotel is constantly searching for new ways to lower its carbon footprint in order to satisfy a clientele who cares likewise about the environment. 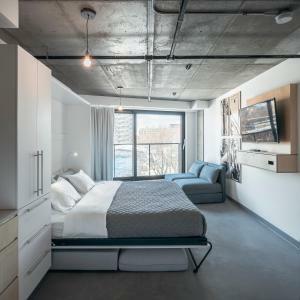 The boutique-hotel encourages local artists, craftsmen, enterprises and products by integrating them into Boxotel for additional exposure and support. Located in the heart of downtown, Quartier des spectacles is Montréal's cultural heart. Within one square kilometre, there are more than 80 cultural venues offering an exceptionally diverse array of activities: festivals, movies, plays, dance performances, art exhibitions, technological art displays, music concerts, operas, comedy shows. It's a constantly evolving destination that literally lights up the night thanks to an innovative lighting plan. House rules Boxotel takes special requests - add in the next step! A damage deposit of CAD250 is required upon arrival, which is about GBP143.72. This deposit is fully refundable during check-out as long as there has been no damage to the property. Boxotel accepts these cards and reserves the right to temporarily hold an amount prior to arrival. Guests must provide the same credit card that was used to book online as well as a matching government-issued photo identification. This property requires a security deposit of CAD 250 upon arrival as well as payment for the full stay. The security deposit must be paid for with the same credit card that was used to book the reservation. Guests must provide the number of guests that will be staying in the room, should an extra person be present without notice, the hotel reserves the right to refuse the extra guest. A damage deposit of CAD 250 is required on arrival. That's about 143.72GBP. This will be collected by credit card. You should be reimbursed on check-out. Your deposit will be refunded in full via credit card, subject to an inspection of the property. Please inform Boxotel in advance of your expected arrival time. You can use the Special Requests box when booking, or contact the property directly with the contact details provided in your confirmation. There is nothing negative to say. Really! Absolutely fantastic hotel, very friendly staff and excellent breakfast!!!!!! Very good location. I like everything about this boutique hotel. Perfect! High tech hotel: push button light switch, shower, drapes. Eco friendly: recycling bins for plastic, paper, composting vegetables separate from fish; toilet that conserves water; different laundry settings to conserve water. Gym and SAUNA are extras. Marylin, the manager is very beautiful and welcoming. Food in the cafe is health oriented. I've set foot on all seven continents, stayed in 5 star hotels, castles, you name it, and BOXOTEL is among my favorites! Pretty much everything. Fun place to be. I couldn't figure out how to change the language on the TV navigation to English. This is my likely my incompetence, but a short summary of how to do this wouldn't have gone amiss. Very comfortable room, very modern facilities! Nothing. It was actually perfect! Traffic noise from outside would awaken me in the middle of the night...police/fire truck sirens. Breakfast was delicious and nutritious, staff was always present and accommodating with my questions and needs, the boutique hotel had bath essentials/toiletries on sale (bought some! ), and the steam room was a real respite after days of exploring the wonderful city. And of course, the automatic control to adjust ambience of room, e.g. lighting. Again, it was a welcome treat to play around with the controls in the comfort of the clean and perfect mattress. I was told I was upgraded to a loft king with a bathtub in the room however the room we were given was not an upgraded room. But the room was still great and location amazing! Location is amazing and the rooftop terrace/pool/spa has beautiful views of the city and a very intimate vibe. My boyfriend and I really enjoyed our stay and will be back next time we are in Montreal! The roof terrace was fab. The breakfast lovely.